Fisher Center at Bard College presents “The Red Violin” this Saturday, November 15 at 8 pm, a concert featuring violinist Elizabeth Pitcairn, and pianist Cynthia Elise Tobey. Pitcairn performs on a 1720 Stradivarius – the famous “Red Mendelssohn Stradivarius” – you can read more about it here. Pitcairn and Tobey will perform pieces by Beethoven, Fauré and Schubert, but also a new, less known piece by composer Sara Carina Graef – “Blue Vishuddha”. For more information, visit fishercenter.bard.edu. The Zadock Pratt Museum in Prattsville is hosting a book reception this Saturday, November 15 at 1 pm featuring “Out Windham Way,” a collection of 400 photographs, maps and ephemera by Larry Tompkins. “Out Windham Way” is a visual representation of the area from the 1880s to the 1940s. For more information, visit https://www.facebook.com/pages/Zadock-Pratt-Museum. Woodstock Artists Association & Museum (WAAM) presents “Lies of the Poets” this Saturday, November 15 at 4 pm featuring poet Leslie Gerber. From WAAM website: “Leslie Gerber was born in Brooklyn in 1943. He graduated from Brooklyn College with a degree in creative writing. For 39 years he ran a mail-order classical music business, while writing thousands of music reviews and articles. 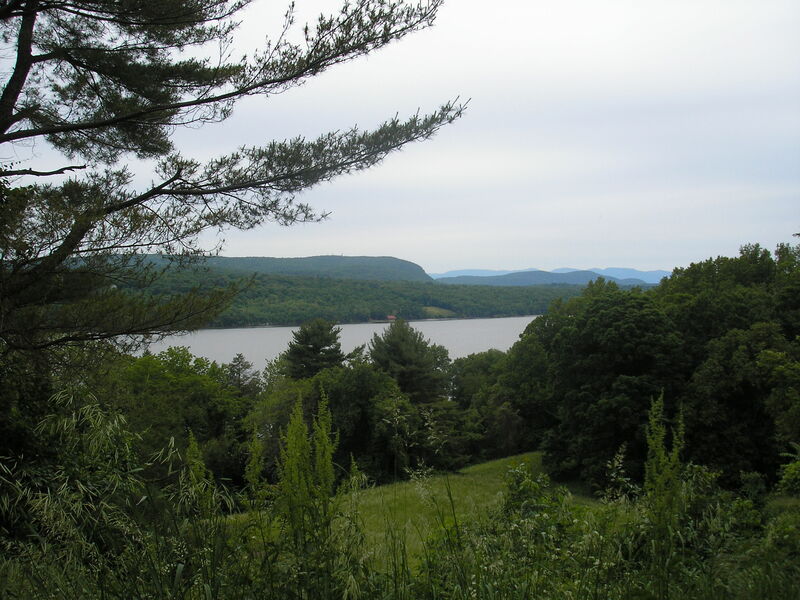 In 1970 he moved to Ulster County and has lived there ever since. He began writing poetry in 1999.” For more information, visit http://waamblog.wordpress.com. The Farmers’ Museum in Cooperstown presents a series of workshops this Saturday, November 15 from 10 am to 4 pm covering anything from printing holiday cards to crafting bandboxes, baking in a brick oven, and creating fine essences like lavender and rose bottled water – all 19th century learning experiences. Just enough to get one in the holiday spirit. For more information, visit http://www.farmersmuseum.org/workshop. 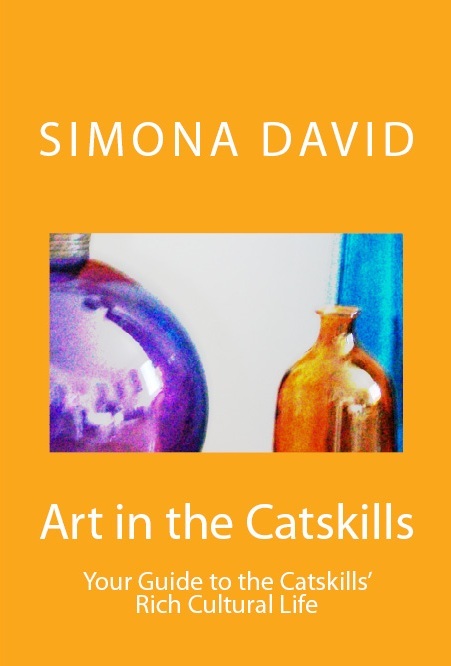 Enjoy an artful weekend in the Catskills! 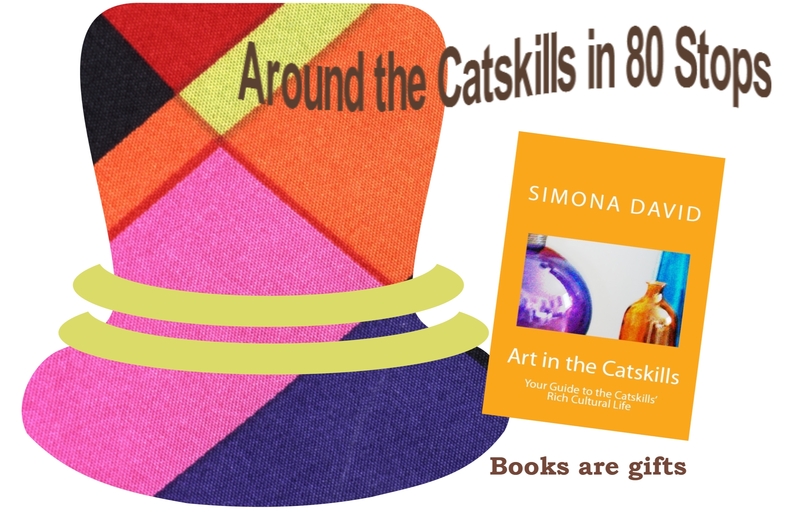 This weekend in the Catskills: a panel on self-publishing, filmmaking workshops, painting classes, theater and puppet shows – difficult to choose where to be, and what to do! 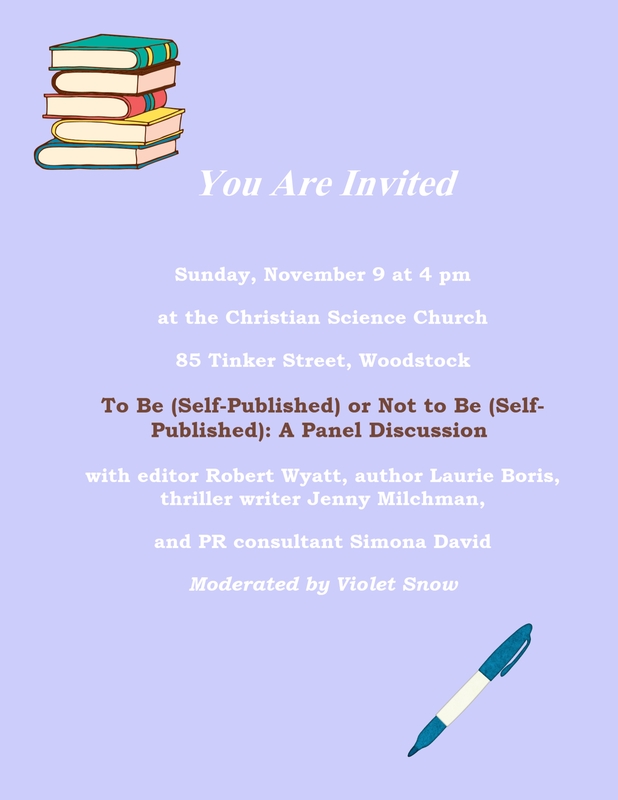 The panel discussion, featuring editor Robert Wyatt, author Laurie Boris, thriller writer Jenny Milchman, and myself is organized by the Glaring Omissions Writers Group and the Golden Notebook Bookstore, and will be hosted by the Christian Science Church located at 85 Tinker Street in Woodstock. The event will take place this Sunday, November 9 at 4 pm. Everyone is welcomed. Catskill Mountains Film Festival presents six filmmaking workshops this Saturday, November 8 at SUNY Delhi. The workshops, held some in the morning, and others in the afternoon, include: “Camera and Lighting for the Emerging Filmmaker” with Alan McPheely, “Make Your Own Indie Feature” with J. Christian Ingvordsen and Matthew Howe, “The Director’s Job” with Dorothy Lyman, “Screenwriting Basics” with Laura Kelber, “Mixing Sound for Movies” with Paul Geluso, and “Iphoneography” with David Kenny. Workshop leaders are all experienced, accomplished filmmakers. 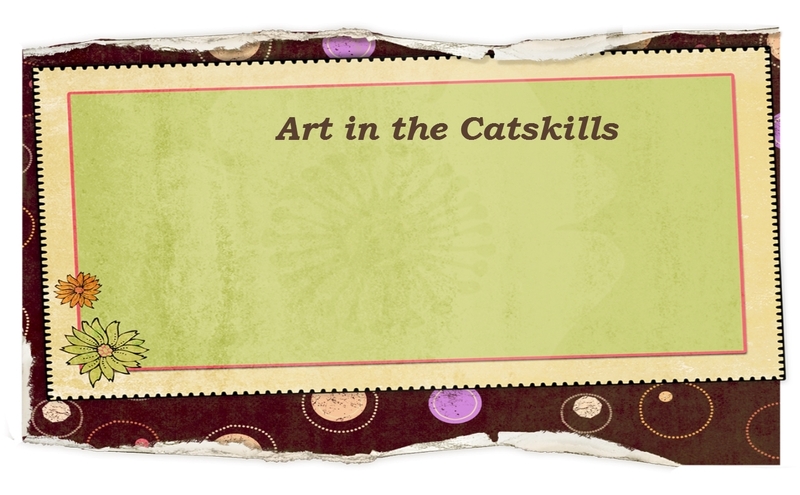 For more information, visit http://www.catskillmountainsfilmfestival.org/. Shandaken Theatrical Society (STS) presents “The Lady in Question” by Charles Busch this Friday and Saturday at 8 pm, and Sunday at 2 pm. From STS: “A free wheeling satire of patriotic 1940’s thrillers such as “Notorious” and “Escape”, “The Lady in Question” tells the suspenseful tale of Gertrude Garnet, the most glamorous concert pianist on the international stage.” More information at http://www.stsplayhouse.com/plays.html. Also, the school will host an opening reception featuring new works by its students this Saturday, November 8 at 3 pm. For more information about the Woodstock School of Art, visit http://woodstockschoolofart.org/. The National Museum of Dance in Saratoga presents a puppet show this Sunday, November 9 at 11 am. The Puppet People will perform “The Wizard of Oz,” and a puppet making workshop will be offered at the end of the show. For more information, visit http://www.dancemuseum.org/events/.